This opinion is based on thousands of lots traded on IG Markets over some months. Why I chose IG Markets ? Why use an IG account sponsored by ProRealTime? 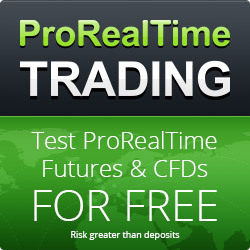 - IG is in 95% of cases the cheapest CFD broker, it has aggressive guaranteed spreads (the only one to offer an absolutely fixed spread regardless of volatility, guaranteed stop, 1 fixed spread on the Dax during the opening of the German Stock Exchange, 1 on the FTSE, 1 on the Cac 40, and not 0.7, 0.8, 0.9 as announced by other brokers and we are left with a spread of 1.5 95% of the time, and it explodes to 4 as soon as there is volatility and yes it is not fixed ^^). - IG allows you to take positions during sales and decline simultaneously (hedging) on the same instrument. This helps to optimize your investments, have a long position for example for swing trading while settling for scalping or day trading. - IG Markets broker is the world leader of CFDs and major French brokers (Fortuneo, Bourse Direct etc.) offer CFDs via an IG white label (with extra costs of course and without smartphone interfaces and Prorealtime ^^). ProRealTime’s CFD Trading service is the combination of ProRealTime Software’s award-winning charting platform and the world's number 1 CFD Broker. With an IG account sponsored by ProRealTime, you also benefit from the exclusive advantages mentioned below. In conclusion, by trading through ProRealTime CFD Trading, I now have the best of IG brokerage services and ProRealTime’s premium platform in a single account. No comment for My opinion on the broker IG Be first !